Unfair assists with helcurt? - General Discussion - Mobile Legends: Bang Bang - Powered by Discuz! Mobile Legends: Bang Bang»Forum › Here I come › General Discussion › Unfair assists with helcurt? [Complaint] Unfair assists with helcurt? In a match, our helcurt was only pushing, not helping us in team fights. He never got a kill, he would only do a little damage to enemy heroes when pushing. But he got 8 assists, and 7 of them were from using his ult when we were killing the enemies. He got a 7.8 gold medal. 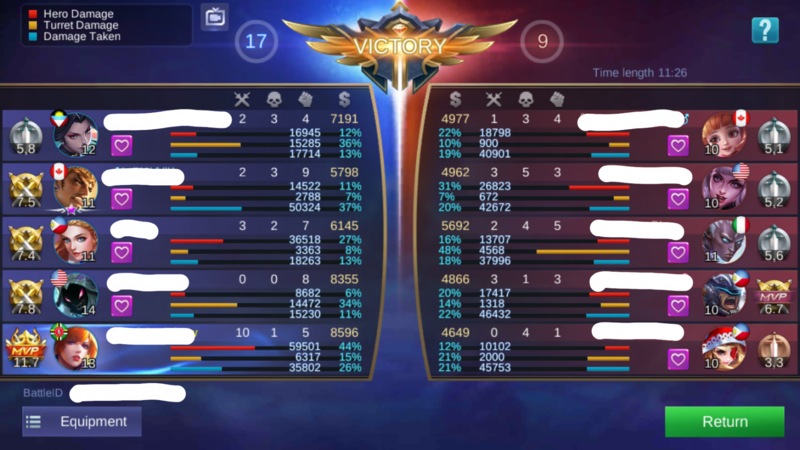 I think it's unfair, because he only helped fight with team ONCE while he only pushed the rest of the game. Helcurt's ultimate can be very crucial during team fights. This blocks the enemy's screen, making it hard for them to assist each other. Making it easy for you to fight against them. Also, your team has very much dominated the game, I do not see a problem if he prefers to prioritize pushing since the rest of you are capable of handling team fights. Towers being pushed also puts pressure on the enemy team. Killing isn't the only way to win games, sometimes too much killing will simply prolong the game and give the enemy a chance to fight back. I believe he made the right call on this one and deserved to get the medal points even though it doesn't really matter that much. He didn't die at least. I mean he didn't feed. Assassin like helcurt can initiate team fight but cant stay in rhat because he is very squishy. He playes solo or assist in gank. That's his role. I don't think he deserved those medal points. He basically let us on a 4 vs 5. He was lucky to have good teammates. Pushing is not the only thing that you should do in a moba. And helcurt's ult is not that beneficial to the team. We could do fine without it. Game not always need teamfight. You must know not all hero need teamfight like Aldous, Hayabusa, Helcurt etc. If no hero push, how to win? Push > Teamfight > Kill Why? Teamfight lead to feed, maybe good team but full teamfight also lose even your team already fed. As I see your team lvl are good enough for teamfight without Helcurt. Even pro player use split push strategy in MPL. Teamfight --> Only lead to Win in late game only. Sometimes picking an assassin is very challenging. Assassin is very crucial and important role beside marksman. In every player's mindset that an assassin is supposed to kill as many as they can. But it is actually wrong. I love to play Gussion and sometimes I provided more assist than killing. It is okay as long you dont feed to die. Helcurt has an ult which is good to help teamfight as Gusion has the daggers to help my teammates. Yes I know, I feel that picking an assassin and dont kill so much is very shameful. But it is ok at least your team win the game and every player plays well. 4 vs 5 is not rare and it happens most of the time. It's not a big deal. Pushing is the main objective of MOBA's if you still have not figured it out. Killing and team fights are second priority. Which is why it's common for a 4 v 5 to take place while one segway and push. It's a very common tactic that works. Helcurt's ultimate is game-changing, you don't feel it on your side because it feels nothing, but impairing the vision of your enemies during team fights has a major impact. And as you said, 4 of you are doing good in this game and is capable of handling 4 v 5 because apparently, you don't need him, then the more reason that prioritizing on pushing was his best choice and using his ult to you help you still means he has map awareness. "You 4 distract the enemies while I try to push" is not new. There is no point in constant clashing, He wasn't even feeding. He helped the team in ways you will probably never understand or accept. Angela cant use ultimate during helcurts ultimate. Thats very important. If helcurt always pushes then one enemy has to protect tower, so its 4v4, if none protect towers its a 4v5 but enemy will sure lose.